LOS ANGELES – Standing against the backdrop of Los Angeles Homeboy Industries, Richard Trumka, President of the AFL-CIO, told a press gathering Oct. 10 that the labor movement stands for fairness and second chances. The afternoon event was held in support of Proposition 47: The Safe Neighborhoods and Schools Act of 2014, an initiative on the November, 2014 California ballot that would limit the types of crimes classified as felonies. 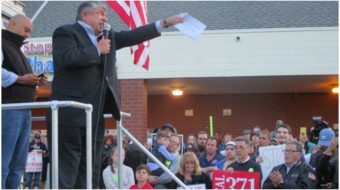 Trumka was coming straight from his major speech on racism in America, given at the annual Missouri state AFL-CIO convention held in late September in St. Louis, not far from the crime scene in suburban Ferguson. There an unarmed, 18-year-old African American named Michael Brown, was shot and killed by local police in August. Pointing to the legacy of racism that has infected the lives of all, he stressed that mass incarceration of people of color is not a result of a higher crime rate, but of laws that criminalize a whole class of people. It is, he said, one of the best-kept secrets in the country. “Under the guise of public safety, we make people less safe by forcing people into a criminal class.” Trumka pledged to do everything in his power to confront and fight mass incarceration, which destroys communities, creates a second-class America based on race, and has resulted in a third of Black men serving time – a rate twice what it was in the 1970s and five times higher than that of whites. Mass incarceration is big business, Trumka said. It has not lowered the crime rate. Lengthy incarceration has cost $80 billion a year. We need to reverse spending money for punishment, end mandatory sentencing, end privatization of the prison industry, support re-entry programs and drug treatment services as a public health issue, and restore full citizenship and voting rights. We need to replace mass incarceration with mass employment. Later in the afternoon, at a panel and discussion held inside Homeboy Industries, Trumka was joined by Maria Elena Durazo, Executive Secretary-Treasurer of the Los Angeles County Federation of Labor; representatives of Homeboy Industries; and the Apprenticeship Director of IBEW, International Brotherhood of Electrical Workers. He was very clear about the task ahead for the labor movement he leads. “We are taking on racism head-on,” he said, “and we intend to be at the front of the parade for justice for every American out there.” Labor is holding town hall meetings all across the country to talk about the broken justice system, to talk, listen, and face both the overt racism that makes the news and more hidden economic consequences of racism that are so pernicious. The theme of mass incarceration was taken up powerfully at the national AFL-CIO convention in Los Angeles in 2013. If Prop 47 passes, it will become a model that can spread across the country. For those who have faced the penalties of Three Strike laws, lengthy sentences for nonviolent drug offenses, and the economic consequences of futile job searches when they have done their time, and for all who want to live in a society that upholds justice and the dignity and value of every single person, there can be no holding back. 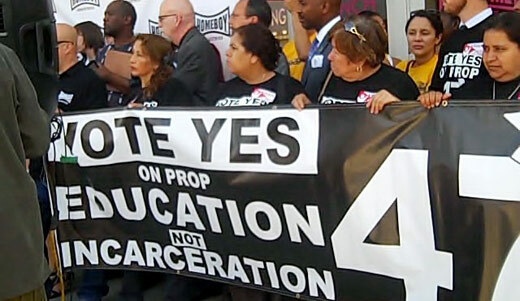 The California Labor Federation, the ACLU, ACCE Action, the California Council of Churches and many other labor and community organizations are supporting the Yes on Prop 47 campaign, one of the most significant responses Americans have made to the “New Jim Crow” incarceration of people of color. A “Yes” vote on Prop 47 will have far-reaching and significant meaning.